shipping is often less than from Amazon. 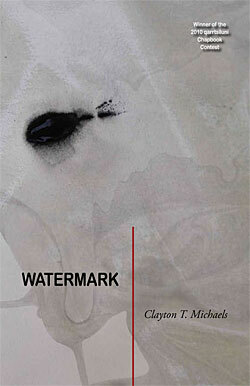 Qarrtsiluni and Phoenica are proud to announce the publication of Clayton Michael's Watermark, winner of the 2010 qarrtsiluni chapbook contest. "It’s this kind of poetry that I find most gratifying; the kind that uses just the right salient concrete images to illicit an emotional response...Furthermore, the surprising juxtaposition of many images gives the poetry a wonderfully controlled surreal and mesmerizing quality—which to me not only holds the manuscript together but raises it to a level above the other submissions." Pamela Johnson Parker, last year's winner, said what she found, in addition to the "superbly succinct" language in these poems, was "that something extra--call it gravitas, call it cohesion--that makes a chapbook a work of art as well as a work of literature." We hope you'll want a copy for yourself or to give as a gift; all sales benefit qarrtsiluni and help us continue publishing, both online and in book form. Clayton T. Michaels is a teacher, poet and musician who currently resides in Granger, Indiana. He has been a featured poet at the online journal Anti-, and his poems have appeared in The Prism Review, Nerve Cowboy, >kill author, Makeout Creek, Slipstream and The Chiron Review, among others. He teaches composition, creative writing, and comic-book-related courses at Indiana University South Bend, and can be found online at his blog.